When Samsung Galaxy S8 and S8+ rumors started showing up back in 2016, many were adamant that the Korean company will follow the same path as its closest rival – Apple – and use dual-lens cameras on the two phones. It even emerged that the Galaxy S8+ will feature two lenses on the back while the standard S8 will stick to the single-lens setup. However, now that we have just about every detail regarding Samsung Galaxy S8 and S8+, we know that these two won’t have anything to do with a dual-lens camera. With this in mind, attention has now shifted to the next flagship from the company – Samsung Galaxy Note 8. In fact, rumors started showing up a few weeks ago suggesting that the Note 8 will be equipped with a dual-lens camera. As if to back this up, fresh patents have emerged confirming that Samsung is indeed planning to introduce dual-lens cameras on its future phones. Many Samsung Galaxy Note 8 enthusiasts must be yearning for a dual-lens camera setup on the phablet, but if the patent images leaked in the latest Samsung filings are anything to go by, the Note 8 might not be the first Sammy device to come with a dual-lens camera. Just like it happened with the 6GB RAM module, it is possible that a midrange device might get the nod ahead of the phablet, which should arrive in the second half of this year. A few days ago, alleged Samsung Galaxy Note 8 design sketches emerged and if these are to be believed, we’ll be seeing the same design language as what is coming up on the Galaxy S8 and S8+. 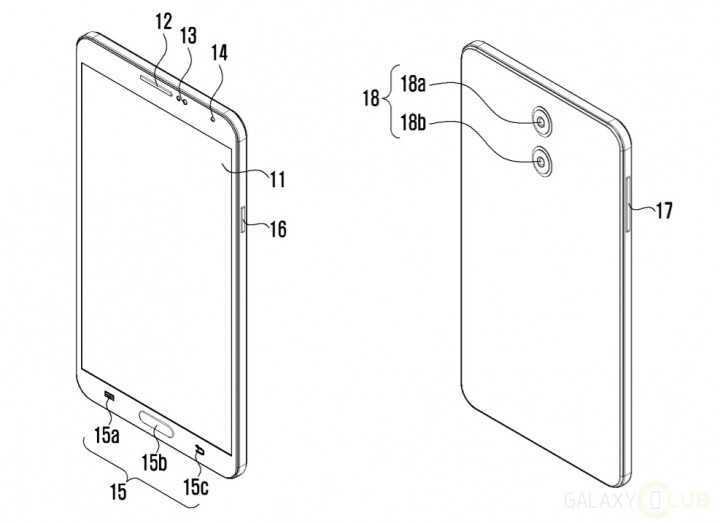 On the contrary, the latest patents about a dual-lens camera on a Samsung device show off a totally different design language – one that would be used on any of Sammy’s Galaxy A or Galaxy C series. One thing that will be no more when the Galaxy Note 8 comes in is the physical home button. However, the latest images show off a device that not only comes with a physical home button but also physical navigation buttons, a traditional screen that has no curved edges as well as significantly huge bezels compared to the S8 and S8+. Be warned that Samsung is notorious when it comes to filing patents that end up never materializing. Whether this is one of those or not we can’t tell at the moment. But what looks possible here is that the dual-lens camera setup might appear on another phone before it is fully refined for use on the flagship Samsung Galaxy Note 8.